At Diamond Valley Dentist, we know how hard it can be living with missing teeth and ill-fitting dentures. If you’re suffering from these issues, you know how hard it can be to enjoy eating, speaking, smiling, and to feel confident. What you may not realize is the damage occurring below the surface where teeth have gone missing. Without the tooth root, the jawbone begins to deteriorate or atrophy, causing sunken face and premature aging. The good news is, Dr. Nathan Jergensen is a highly skilled and experienced implant provider in Hemet, CA and he would love to help you improve your smile and quality of life with dental implants. We are proud to have a bilingual team so if you're a Spanish-speaking patient, we can ensure you receive quality care you can feel confident about. Dental implants are the most recommended tooth replacement solution, by both doctors and patients alike. That’s because implants go beyond your typical tooth restorations that sit on top of the gums like traditional crowns, bridges, and dentures to replace the root of the tooth, which is an essential component of a healthy, functional smile and jawbone. Dental implants are small posts or screws, typically made from biocompatible titanium that’s strong and durable, and encourages complete integration with the jawbone. Once healed, dental implants serve not only to protect the jawbone but to securely lock permanent restorations including crowns, bridges, and dentures in place for the most life-like solution to missing teeth. There are many benefits in replacing missing teeth and stabilizing dentures with dental implants, ranging from functional to aesthetic to health improvements. Dental implants are the only way to completely replace a tooth or teeth. 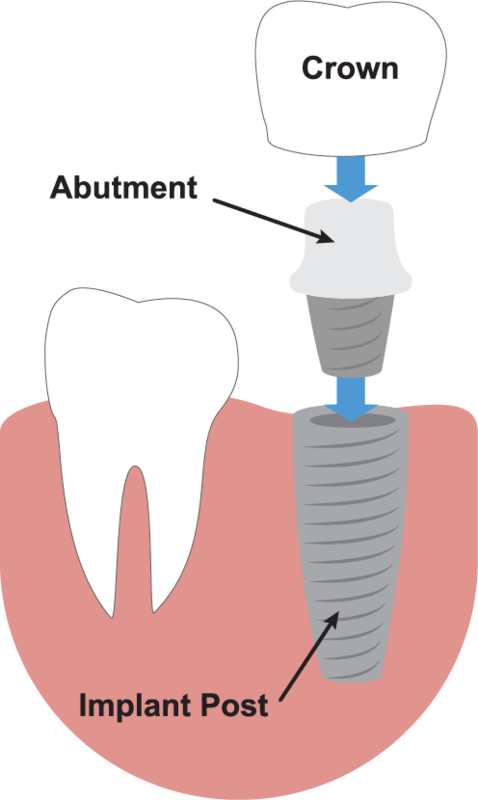 Once placed, the implant actually stimulates new bone and tissue growth around the implant, restoring and rejuvenating your smile to prepare for a replacement tooth or teeth. Dental implants lock restorations in place so you don’t have to worry about removable bridges and dentures getting in the way of your life. “Honestly I hate going to the dentist because of past experiences, but when I went to Diamond Valley Dentist, they made me feel almost like family. I wasn’t afraid to ask any questions and each one I asked was answered without hesitation. I’m feeling confident for my next appointment with them.” – Cheyenne C.
Dental implants do require a certain level of oral (jawbone) health to ensure successful treatment. If you’ve had missing teeth for a while, your jawbone may have deteriorated to the point where it is not healthy and dense enough to support implants. However, if that’s the case, we may be able to refer you to an oral surgeon or implant specialist who can perform a bone graft to supplement your jawbone to support dental implants.To determine if you’re a candidate for dental implants, you should schedule a consultation with Dr. Nathan Jergensen. He will sit down with you one-on-one for a comprehensive consultation to determine if you are a good candidate for dental implants. If you’re worried about the cost of implants, we do have financing options available to help you get the best solution you deserve, without breaking the bank. If you’ve recently suffered the loss of your natural teeth, or you’re living with old, ill-fitting dentures that are clunky and embarrassing, we would love to help you secure your smile with implant supported dentures. Implant supported dentures provide freedom from removable dentures and messy denture paste, and can even be cleaned and maintained just like natural teeth. All the while, the implants are stimulating the jawbone and preventing bone loss, sunken face, and premature aging just like your natural teeth would. At Diamond Valley Dentist, we believe in aging with grace, and a healthy, functional smile is an important part of that. 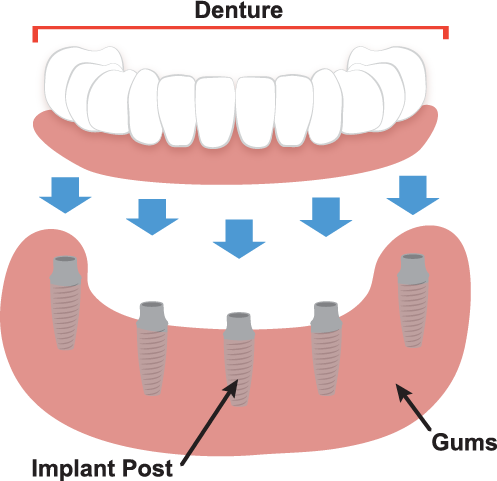 With implant supported dentures, you can enjoy eating, speaking, and smiling with confidence. We would love to help you secure your smile so you can get back to the things that matter most – like sharing your beautiful smile with those you love. If you have any questions about dental implants or would like to schedule a consultation with your Hemet implant dentist, Dr. Nathan Jergensen at Diamond Valley Dentist, give us a call today at (951) 763-8862 or schedule a visit online! Fill out this form as soon as possible and we will get in touch with you during following business day. Please call us at (951) 763-8862 or fill out the form below to request an appointment.